NEWS: Austerity Pope – Greek car recovery – Let the ‘Ring decide. Channel delays: DFDS Dover-Calais/Dunkirk. Delays 60mins Dunkirk sailings and 30mins Calais. Eurotunnel Freight, 2hrs delay at UK terminal. Weather alerts: Amber alert for heavy rain/storms north east Italy. Weather: unsettled in north and central with rain spreading south through Italy. Traffic: see @DE_Traffic from 09:15 BST. Austerity Pope. Are we the only ones to think the poverty drive at the Vatican is going a bit far? 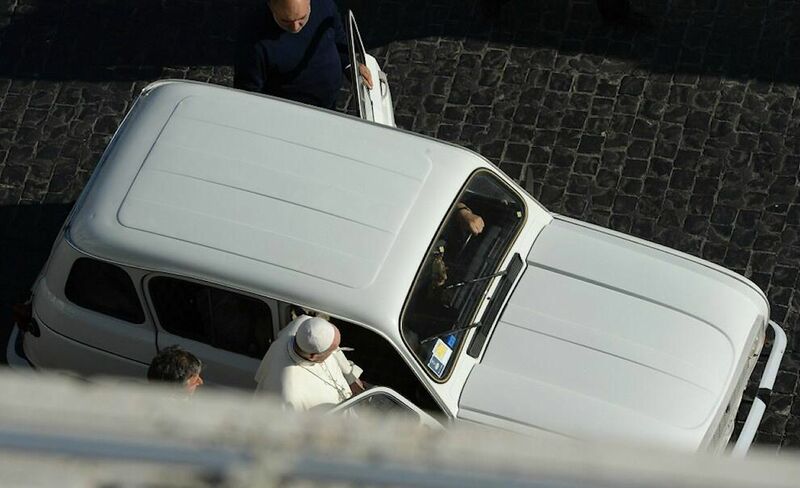 Pope Francis has accepted the kind donation of a 20 year old, 300,000km Renault 4L from a priest in Verona. He’ll reportedly use it to drive himself around the tiny city state. You have to admire his taste, the cheap and chic R4 is an icon of a golden age of simple French motoring, but whatever next? Half a wafer at Communion? Wine turned back into water? Pic via @Javier_quimera, boss of the EV racing manufacturer. Exotic car registrations in Greece. Via @Hekimoglu, retweeted by @NickMalkoutzis, deputy editor @Ekathimerini. Greece – the bottom may have dropped out of the luxury car market but there are signs of recovery overall. Total registrations, new and used, were down 6.5% in August compared to the same month last year though that’s significantly less compared to the year previously when sales fell 44%. 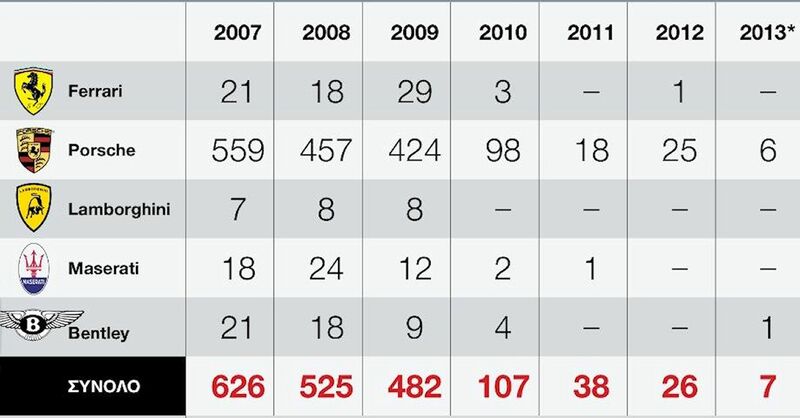 Similarly, year to date figures are down just 3% on 2012 which itself had seen a 40% drop on 2011. Let the ‘Ring decide. 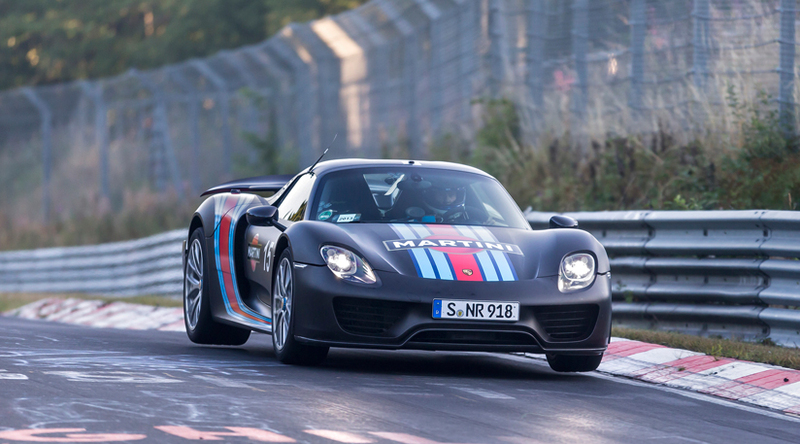 So, Porsche’s new 918 ‘hybrid hypercar’ has lapped the Nurburgring Nordschleife in 6m57, breaking the magic seven minute barrier for the first time. We reported rumours last week that McLaren’s own P1 hyperhybrid had only managed 7m04, despite being lighter than the 918, more powerful and quicker in a straight line. You have to assume that Porsche is well aware of everything that happened at the Ring when McLaren visited, why else risk their glorious announcement? The question is, despite its on paper disadvantages, how did the 918 manage it? One possibility is the brakes, a brand new blending mechanism invented by Bosch that seamlessly mixes the mechanical force of the callipers with the retardation of the electric motor for super stopping power. Makes McLaren’s earlier boasts about its mirrored Akebono discs suddenly look a bit hollow. All of a sudden, the 918 – which had looked the cheap loser beside the more exclusive P1 and La Ferrari – is making a late dash for the line. McLaren will have to respond, but how? The only certain winner so far is the Nordschleife, reborn as the spiritual home, and objective judge, of this new breed of sportscar. That could be the best timing of all considering it’s due to be sold at any moment.